The opening bars using lockpicks, is not very complicated and the best way to learn is the ability for the prologue. 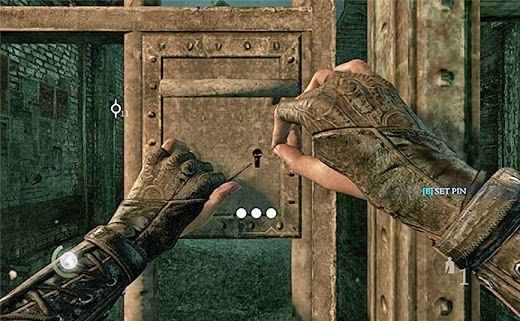 At this point, remember that your character is totally helpless while opening a lock. Thus, always remember to check if there's no one around before starting to open. Otherwise, wait for as much as necessary, until things calm down again. You should also take special care when dealing with locked doors, because there is always the possibility of there being a guard on the other side. The best way to guard is looking through the keyhole, giving a good view of the other side. The risk linked to the detection Garret, during the process of opening a lock, can be lessened with a releasable object, which will divert the attention of nearby guards and earn some extra seconds to complete the process. In addition, you can use focus to their advantage, since it is a feature that speeds up the process of opening. Later in the game, it will also be helpful to invest in gold utensils best break locks. It is not recommended to invest your gold into new points to focus (focus upgrade), early in the game, when you are at the "Queen of Beggars". They are not very expensive, but the best way is to spend their gold on upgrades to your equipment and make sure Garret always have a certain amount of basic supplies with him. Of all the categories of improvement to focus ability, it is recommended that you turn your attention to just three. Dexterity (Dexterity) helps a lot into hiding as you open locks or steals NPCs. Since the Stealth category decreases the risk of being seen while exploring an area, especially when riding on surfaces that make noises, such as broken glass and water. Efficiency (Efficiency) allows you to start the most useful features of Focus.